The National Commission for Culture and the Arts (NCCA) and the Komisyon sa Wikang Filipino (KWF) both headed by National Artist for Literature Virgilio S. Almario, in partnership with the National Book Development Board (NBDB) led by Flor Marie Sta. 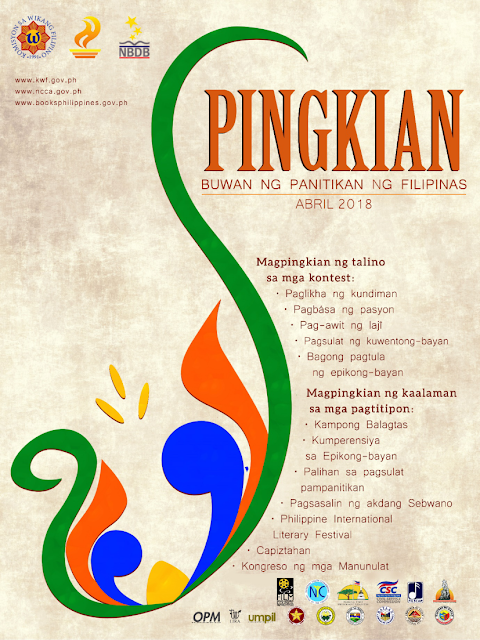 Romana-Cruz, along with other organizations, institutions, and local government units, will be spearheading this coming April the festive celebration of the Buwan ng Panitikan ng Filipinas or National Literature Month (NLM). Being conducted now on its fourth year the theme of National Literature Month for 2018 is that of “Pingkian”—or dialectical friction or conflict igniting fire—which was also the nickname used by the revolutionary leader and writer born from Laguna: Emilio Jacinto. Pingkian as a theme highlights the revolutionary function of literature as a springboard of dialogic discourses and discussion toward progress. Fiery literary and cultural events are lined up for the whole month of April which will all in all ignite, innovate, and invigorate the creative imagination of the needing nation. 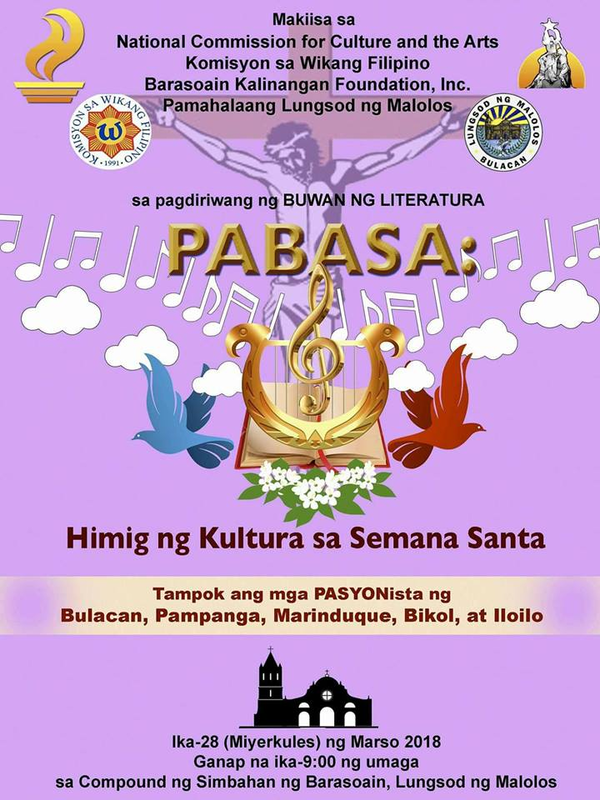 For 2018, the National Literature Month will begin with an event prior even to the month itself, starting on the end of holy week with “Pabasa: Himig ng Kultura sa Semana Santa.” Pabasa will happen on March 28 at Malolos, Bulacan, and will convene local readers of the pasyon for a competition that seeks to preserve and promote tradition. Following this is the official opening of NLM at Orion, Bataan, happening from April 2 to 4. The said opening which hereby takes the form of the “Pambansang Kampong Balagtas” will honor the prominent Filipino poet laureate Francisco “Balagtas” Baltazar, and will feature a national literary camp to cater to 104 chosen student delegates all over the country, in order to hone their skills in creative writing. The “Kampong Balagtas” national camp will happen at Orion Bataan Elementary School, and will coincide with the 230th birth anniversary of the titular prolific poet who penned Florante at Laura himself. As part of the thrust of promoting knowledge of local culture and literature for NLM, four competitions will be launched nationwide. First of which is the “Rene Villanueva Young Adult Prize” for the writing of young adult novels by the youth themselves. With the official launch of contest guidelines and rubrics happening on April 2, and the deadline of entries occurring one year after in 2019, the contest will give budding writers time in order to craft their fiction. The contest is in honor of the late writer Rene O. Villanueva who excelled in the writing of plays and stories for children be it on paper, theatre, or television. Next is the “Timpalak Florentino Hornedo” which alludes to the late scholar, writer, professor, and researcher Dr. Florentino Hornedo, whose research concerning the literary Ivatan song and intangible heritage “laji” influenced the cultivation and preservation of such heritage. “Timpalak Hornedo” therefore relates to the singing of laji by millennials in order to promote the once waning tradition. The preliminary competitions are already happening this month of March with contestants coming from junior and senior high school students from six municipalities in Batanes, with the finals night happening on April 9 at Basco, Batanes. 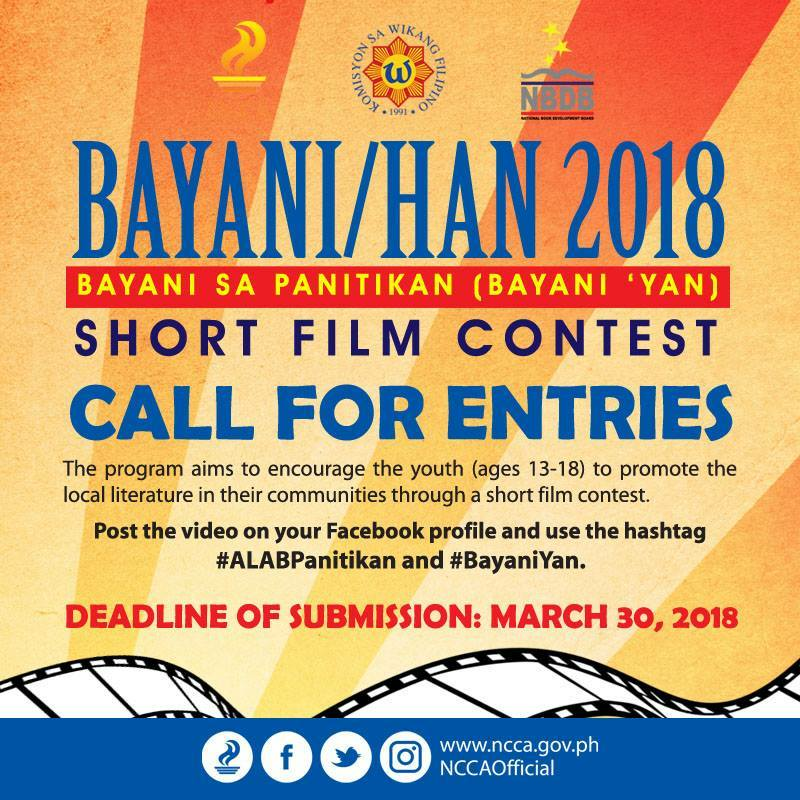 Third among the competitions is the “Bayani/han 2018: Bayani sa Panitikan” short film contest, which is open to the youth ages 13 to 18, and which aims to encourage the appreciation of each region’s specific literatures by way of encouraging filmic adaptations. With the deadline of online entries set on March 30, the announcement of winners on April 20 at the Cultural Center of the Philippines (CCP), and with prizes leveled at Php 35,000, Php 20,000, and Php 10,000 respectively for first, second, and third place, the competition seeks to unravel by way of ground-up promotions local narratives and stories which showcase particular and national conditions. Finally comes the “Timpalak Kundiman 2018” contest which is open to all Filipino musicians and composers. Timpalak Kundiman seeks to stimulate the traditional practice of writing and singing the classical form of Kundiman—with the 3⁄4 time signature—by way of engaging contemporary artists. 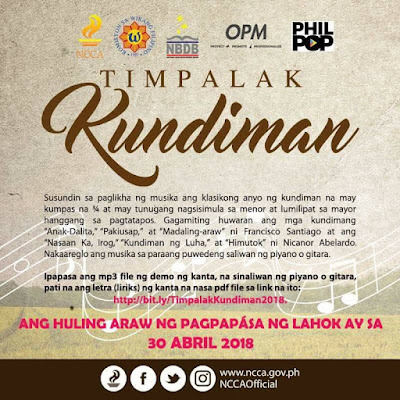 In partnership with the Organisasyon ng mga Pilipinong Mang-Aawit (OPM), and Filipino Society of Composers, Authors and Publishers, Inc. (FILSCAP), Timpalak Kundiman will give out the prize of Php 250,000, Php 150,000, and Php 100,000, for the first, second, and third winning musical productions and arrangements respectively. This is all for the revival of kundiman as a significant intangible heritage. As for the case of creating critical spaces to talk about the current state of the country’s literatures, five national events will take place that will start discourses and discussions on the matter. Happening from April 13 to 15, a national conference on local literature, language and culture will be convened at Pangasinan State University, with the lead cultural institutions as conveners. Come April 18 to 20, a national reorientation on the production, consumption, and teaching of literature will happen at Bukidnon State University. 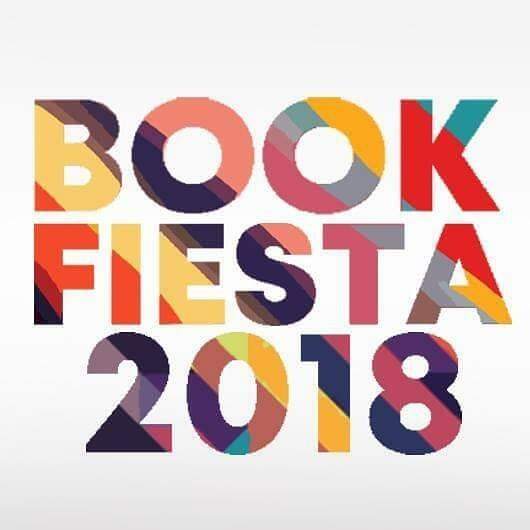 Following this, on April 23, is a talk at Instituto Cervantes, Makati, to be led by NBDB concerning the “World Book and Copyright Day.” While on April 25 at the Polytechnic University of the Philippines, Quezon province campus, is a talk entitled “Pagtuturo ng Panitikan at Pananaliksik,” concerning teaching local teachers on how to handle with more vigor and vibe the teaching of humanities and literature. Finally, from the 26th to 28th is a “National Seminar on the Teaching of Gender-Based Literature” to be convened at Benguet State University in the Cordilleras. Now on its 9th year, starting even before the institutionalization of the NLM, the NBDB along with the NCCA will conduct the “Philippine International Literary Festival” (PILF) which will aim to engage writers, critics, and readers in the celebration of literature and in the promotion of the best practices of producing texts, in reference to the trends of the book industry. The PILF will also feature the project “Read Aloud” which is an activity designed to provide a platform for persons with disabilities, elderlies, out-of-school youths, and indigenous peoples to discover the refuge of literature and its ability to comfort the disturb, and disturb the comfortable. 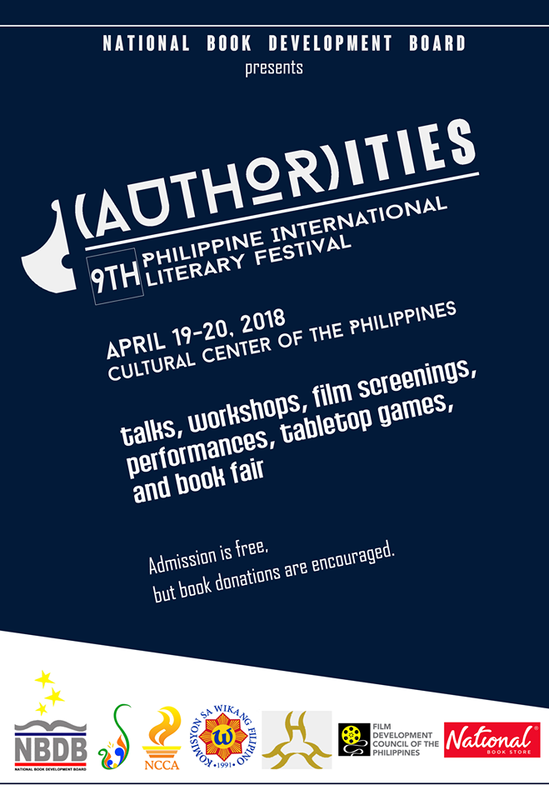 For 2018, the PILF will happen from April 19 to 20, at the CCP Complex. Come April 21 and 22 is the “Tutok Sebwano,” to be held at the University of San Carlos, which will gather established writers, critics and artists from different regions of the country, bounded and brought together by the same language and Visayan affinity, to talk about Cebuano literature and how to move forward. Finally come end of April is the largest convention of prominent creative writers, readers, and enthusiasts for the month, with the Unyon ng mga Manunulat sa Pilipinas (UMPIL), or the Writers Union of the Philippines, convening its annual “National Writers’ Congress” at the Gerry Roxas Training and Convention Center, at Roxas, Capiz, on April 28. In the said congress, UMPIL will grant to its adjudged winners prizes such as the annual Gawad Pambansang Alagad ni Balagtas, which recognizes a writer’s excellence in the field of creative writing and considerable contribution to the country’s corpus of literatures, Gawad Pedro Bucaneg which recognizes writer’s collectives, and Gawad Paz Marques Benitez which honors teachers of literature and culture from different localities in the country. Other events for the NLM include the “Peregrinasyong Jacinto,” which is a literary pilgrimage at Magdalena, Laguna—where the aforesaid revolutionary writer Emilio Jacinto was born, raised and killed—that will happen on April 16. Come April 10 to 12 is the “Storya-storya ug mga Bakwit,” to occur at Mindanao State University – Iligan Institute of Technology (MSU-IIT) in Lanao Del Norte, which will feature the experiences of ‘bakwits’ or evacuates in war-torn Mindanao through the dance, musical, and poetic performances of Southern artists. While ultimately, at sites such as in the offices of the Civil Service Commission and House of Representatives will be “Tertulya” events, or the reading out loud of Filipino poetry. Set to happen on April 23, Monday from 9:00 a.m. to 6:00 p.m. at the Plaza Moriones, Fort Santiago, Intramuros, Manila, Book Fiesta 2018 is the National Book Development Board - Philippines’ (NBDB) celebration of the World Book and Copyright Day (WBCD) in partnership with the Intellectual Property Office of the Philippines (IPOPHIL), National Commission for Culture and the Arts (NCCA), and Intramuros Administration. WBCD is annually observed all over the world every April 23, and aims to promote reading, publishing, and copyright. All are invited to come and enjoy a spoken word poetry workshop, a calligraphy workshop, a book binding demo, a cultural performance, a Balagtasan (traditional Filipino poetic debate), storytelling sessions, and a puppet show, among others. On top of that, an exhibit area will be set up for book fair, caricature, face painting, and t-shirt and tote bag printing booths. Freebies will be given away during the event. Through the efforts of National Artist Almario, Proclamation No. 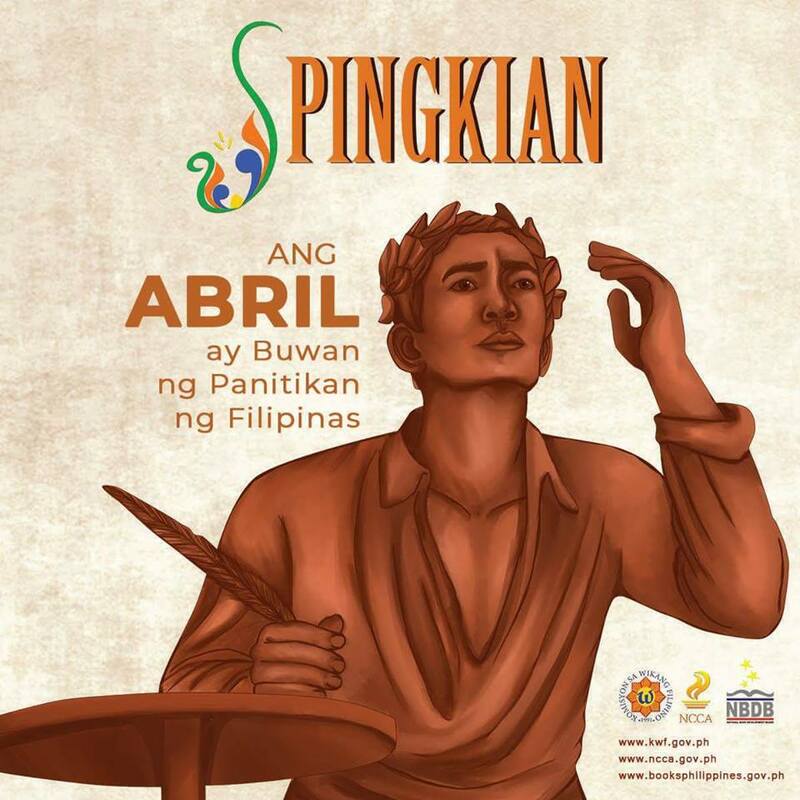 968 was signed in 2015, declaring the month of April as Buwan ng Panitikan ng Filipinas or National Literature Month. The proclamation states that “Philippine literature, written in different Philippine languages, is associated with the history and cultural legacy” of the country and must be therefore “promoted among Filipinos.” “National literature,” to say finally, “plays an important role in preserving and inspiring the literature of today and in introducing to future generations the Filipino values that we have inherited from our ancestors.” It is in this light that in tracing our revolutionary history, Pingkian as a process is important for it is through dialectic friction that one could ignite, innovate, and invigorate the creative imagination of the needing nation. For more details, contact Rene Sanchez Napeñas, head of the NCCA Public Affairs and Information Office (PAIO) at 527-2192 / 09285281057. E-mail at ncca.paio@gmail.com or visit our website at www.ncca.gov.ph.